Owning a car in winter can be a chore. Use these tips and tricks to make cold weather car ownership a little easier. 1. CLEAN YOUR WINDSHIELD WITH SHAVING CREAM. If your windows look like that scene from Titanic anytime you get in the car, grab a can of cheap shaving cream. Coat the inside of your car windows with a thin layer of the cream, which has the same active ingredients as defoggers, then wipe them clean. Now your windows won't fog up while you’re driving. 2. WRAP YOUR CAR'S SIDE MIRRORS IN PLASTIC BAGS. Unless you own a garage, you'll never be able to keep your whole car snow- and ice-free, but side mirrors are easy: Just wrap them with gallon-sized plastic bags and use rubber bands to secure them. When you're ready to drive, slip off the bags and admire your perfectly clear mirrors. 3. USE HAND SANITIZER ON YOUR KEYS. When temperatures get low enough, car locks can freeze—and your keys can get stuck. Avoid this annoying situation by coating your keys in a little bit of hand sanitizer. The alcohol in the sanitizer will quickly melt the ice inside the locks. You can also spray some WD-40 on your locks, which will prevent ice from building up inside. 4. PUT OLD SOCKS ON YOUR WINDSHIELD WIPERS. 5. THROW A RUG ON YOUR WINDSHIELD AFTER PARKING. When storm clouds gather, throw an old rug, carpet, or tarp in the trunk of your car. When you park, you can throw it over your windshield to prevent snow and ice from sticking to it. You can also use your makeshift windshield cover for additional traction if you get stuck in the snow. 6. USE A PENNY TO CHECK YOUR TIRES. When it comes to driving in snow and ice without slipping, it's all about tire treads, which give your car traction on slick surfaces. If you’re not sure if your tire tread is ready for winter, reach into your change jar and grab a clean penny. Hold the penny with your fingers grasping Lincoln’s body and then place it in one of the grooves of your tire with the president’s head pointing into it. If the top of Lincoln's head disappears, then your tires are fine for the winter. But if the treads only reach the top of Honest Abe's head, it's time to buy new tires. Makes you question the movement to get rid of the penny, doesn't it? 7. PULL SOCKS OVER YOUR SHOES FOR MORE TRACTION. Stuck in the snow with shoes that aren't giving you enough traction for a big push? Grab those socks you used on your wiper blades out of the glove compartment and pull them over your shoes. They'll give you more traction for pushing. 8. USE COOKING SPRAY ON YOUR CAR DOORS. When temperatures plummet, doors have a tendency to get stuck. Avoid a cold weather tug-of-war with your car door by hitting the kitchen and grabbing some cooking spray the night before a storm. Coat the outside rubber edges of the doors and wipe them clean. The cooking spray acts as a lubricant, making it hard for ice to form. 9. USE AN OLD CREDIT CARD AS AN ICE SCRAPER. It’s always a good idea to invest in a high quality ice scraper—it will get ice and snow off your windshield faster and easier than cheap ones. But in a pinch, some commonplace items can serve as substitutes: an old credit or gift card or a plastic spatula (just don’t use a metal spatula—it will damage your windshield). 10. DE-FOG WITH CAT LITTER. If you want to reduce foggy windows and mirrors, put some extremely absorbent cat litter (the silica kind works best) in a couple of socks and place them in the car. They’ll absorb the moisture that creates fog. 11. REMOVE SNOW FROM YOUR CAR'S ROOF WITH A PUSH BROOM. It’s probably a good idea to invest in a push broom, but any type of broom will do (just be careful that it won’t scratch your paint). Start by pushing snow off the roof; when the top is clear, remove snow from lower areas. Getting all of the snow off your car isn't just safe—it could save you money: It’s increasingly becoming law that you can be fined for having snow coming off your car. 12. KEEP SOME KITTY LITTER IN YOUR TRUNK. To give the back tires of a rear-wheel drive car a little more weight for better traction, buy a 20-pound bag of kitty litter and leave it in the trunk of your car. This will help ground your rear tires over snowy roads. You can also use a heavy bag of road salt. 13. USE YOUR CAR'S FLOOR MATS FOR MORE TRACTION WHEN YOU'RE STUCK. A piece of cardboard or your car’s floor mats could be used under your tires if you need more traction to get out of a small snowbank. If things get really desperate, you can break out that kitty litter and throw some under the wheels for added traction, too. 14. MAKE YOUR OWN WASHER FLUID. You can go through windshield washer fluid very quickly in the winter. Why spend the cash when you can make your own with household supplies? Here's how: Fill a large bottle or jug with a gallon of water. Mix one tablespoon of dish soap, half a cup of vinegar, and a few drops of blue food coloring with the water. To prevent your mixture from freezing, add one cup of isopropyl alcohol. Keep your homemade washer fluid outside to test whether it will freeze or not before you add it to your car. If the fluid is frozen or slushy, just add more alcohol. 15. PARK YOUR CAR FACING EAST. Try to face the east when parking overnight. 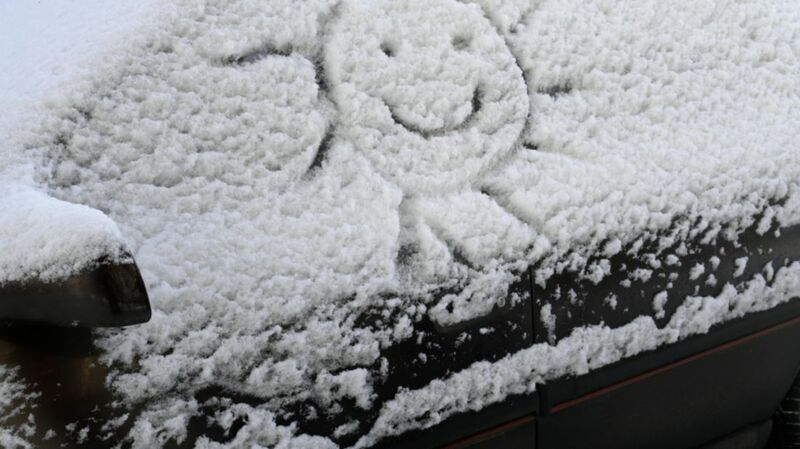 This way, the sun, as it rises, will melt some of the snow and make it easier to scrape ice off your car.